It is three months away from Christmas. I have started on clearing up the house and sprucing it up. It is amazing at the amount of items that the kids have accumulated over the span of a year. I really need to sort out and clear up their shelves before we head on our annual trip back to Hong Kong to visit the relatives in a few months time. We will be stocking up on bigger sized clothing and shoes for the kids. Yeah!! Another shopping trip. 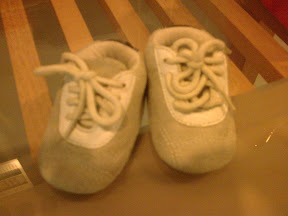 While clearing up the display cabinet of ours, I chanced upon the pair of baby shoes that we used for Roy when he was newborn.He only managed to use that pair of shoes twice before he outgrew them. Doesn’t it look super cute? ?This is the 1st newborn baby gift that I bought for Roy. I bought it for him during a shopping trip back to Hong Kong when he was just 4 months old in utero. This pair of shoes has great sentimental value for me It is among the items that I keep alongside the hospital identification bands that were put on his ankles immediately after he was born. To offer my child a unique personalized baby gift was something on my mind before he was even born. Roy, being the 2nd born, did not receive as many gifts as Ryan. We didn’t even get around taking as many videos and photos as we did the last time. However I do make it a point to keep a record of all important milestones and put side a box of “treasures” for him to rediscover when he gets older. I chose a pair of shoes this time around as I wanted something different from the traditional personalised silver spoon. Customised baby gifts were what I wanted for for Roy. Touching the leather and wearing the shoe for the baby is more meaningful to me. It definately is more usable than a metal spoon for the newborn baby and the leather binding their feed gives them a sense of warm and affection. I always feel that babies wearing laced up shoes look much cuter then fuzzy or cloth booties. The shoes are not kicked off so easily and more protection is given to the feet as compared to a thin piece of cloth. Custom leather baby shoes are getting more popular nowadays. At the sole of the shoe the baby’s name and birthdate are embossed in. You can also find them being packaged with the baby’s name on a pail and a cute little accompanying soft toy. The pail can be used to store all the babies toiletries or even use together with a spade when you bring him on an outing to the beach when he grows up.